The Basalz is a mob added by the Thermal Foundation mod. 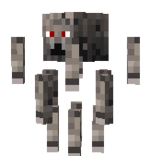 A rocky looking Earth Elemental that spawns in a mountainous or barren biome such as Extreme Hills at a light level of less than 8, usually in a pack of up to 4, spawning about 10 times less often than a pack of other hostile mobs . While idle, it just wanders around leaving a trail of dark coloured dust particles. Its breathing is muffled and makes a sound like falling rocks. Upon sensing a Player it will hover and attack by shooting rocky bolts that causes 5 points of damage and a Weakness effect. It will pause a few seconds before attacking again. When killed, it may drop a pile of Pulverized Obsidian and a Basalz Rod this can be enhanced using a sword imbued with the Looting enchant to slay it. ↑ The spawning rate is configurable. The Basalz vaguely resembles the Blaze. This page was last modified on 22 July 2018, at 18:50.